Are your kids going crazy being stuck inside while it rains? You can keep them entertained with these creative rainy day activities. All of these fun ideas can be done inside, so when the storm clouds roll in, you’ll still see sunny smiles! Get in some last minute Sponge Water Bombs play time before the summer is over. Looking for a fun and colorful way to keep the kids busy on a rainy afternoon that is keeping you indoors? This fun and easy faux stained glass can be made with just markers and regular clear kitchen cling wrap. It is guaranteed to keep kids entertained and coloring away for hours on end. It is super simple to make too. Just follow the simple tutorial to get your kids started. A mom’s quick and crafty thinking on a rainy afternoon yielded this amazing project for kids of all ages. Challenge your kids to create a brand new outfit out of some recycled newspaper with the help of markers, scissors, and clear tape. Start with these easy instructions for constructing a newspaper shirt, then let your kids’ imaginations run wild making all sorts of other newspaper items. Summertime means beautiful flowers, animals foraging, and plenty of creepy crawlies. This fun kid’s craft can help teach kids about insects with a fun and colorful afternoon craft. Create plastic spoon bugs on a branch with simple materials and a little bit of creativity. Paint the business end of a spoon to look just like a bug and then thread it through a green felt leaf. Dr. Seuss is one of our favorite authors around here. The classic books and silly stories always liven up our day, and these Dr. Seuss coloring pages make the perfect after-reading activity. There are three different versions of each coloring page filled with favorite Dr. Seuss quotes. They are all inspirational and perfect for young children, teens, and even adults. This Kool Aid Playdough is so easy to make and smells amazing. We whipped up a batch last weekend and my son absolutely loved it! The best part is that kids can make this playdough almost completely by themselves as long as an adult handles the boiling water. The dough is so soft and nice to work with that even mom and dad are sure to sit down to play with it. I don’t know about you, but I am always looking for something fun to keep my kids occupied while traveling, during church, or any other time we have to wait around for longer than normal. For parents with busy kiddos, these dry erase activity books are a must make! Filled with various engaging and educational printable activities, these books are sure to be used over and over again. Clothespin crafts are the perfect quick and simple crafts to make with your children. They aren’t difficult to make and will keep the attention of even younger kids. Check out this round up of four wonderful ten minutes clothespin crafts to gain inspiration for your next project. Choose between clothespin airplanes, clothespin dragonflies, clothespin caterpillars, and clothespin hatching eggs. Great for sensory play, this simple bubble activity is great for preschool aged children on a rainy afternoon. Create a bubble party right in your bathroom sink by using a drinking straw to blow bubbles in a sink filled with soapy water. The concept is simple, but bubbles can be so magical. Break out the bath toys so that they can join the bubble filled party. Here is a quick and simple idea for practicing fine motor skills using materials that most of us have on hand – a colander! This Fun with Pipe Cleaners fine motor activity takes no time to set up and is great for when you need to keep your little ones busy while you make dinner. Give your kids a colander or two, a pack of pipe cleaners, and let them poke them through the holes to make all sorts of silly sculptures. We all adore our children, but we certainly can’t entertain them all day long every day. Instead of sticking them in front of the television or computer, break out this boredom buster “Bored” Game to encourage them to practice their creativity and a number of other skills. They can pick cards that include exciting challenges like learning a new joke, making a pompom pattern, or writing a letter to a friend. This is a super fast and fun way to reuse an empty peanut butter jar. With just a few household items you can turn a cleaned-out jar into a “busy jar” – an interactive search and find activity for the kids! You can throw this DIY boredom buster together in under ten minutes with about one dollar worth of uncooked rice and any small items you can dig out of your junk drawer. If you are looking for eco-friendly craft materials, yogurt cups come in very handy. Transform a recycled yogurt cup into one of these trendy cuff bracelets with a few household materials and your crafty hands. 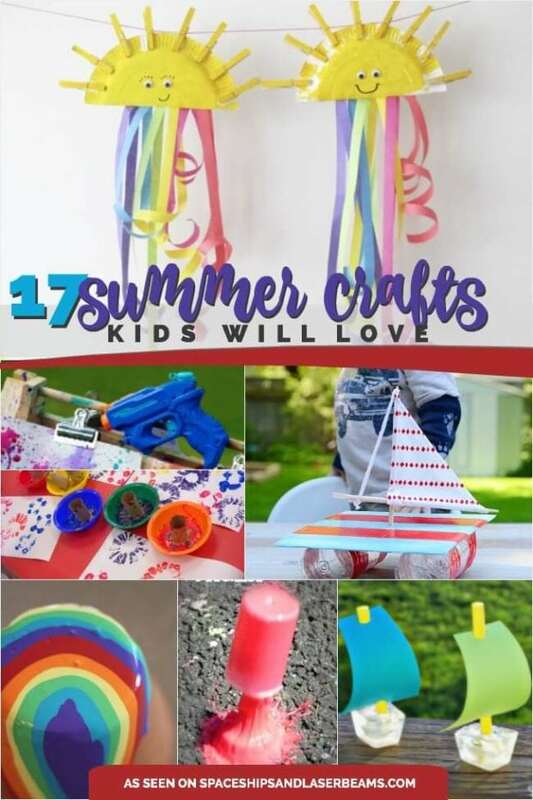 Once the cups have been washed and cut by an adult, older children can decorate their bracelets themselves with a hot glue gun and some patterned ribbon or yarn. LEGO! That is a magic word to most kids out there and even some adults. This homeschooling mom sought out on a quest to use LEGO in fun ways to teach her kids about different things in the curriculum. One of the science experiments she did with her boys was an ice excavation. Her kids worked together to free a LEGO minifigure from an icy tomb. I wonder if collecting rocks is a genetic trait because my boys love to stuff them in their pockets and sort them out at home. Put those collections to use with this fun pet rock project from Red Ted Art. Kids can turn their rock into any animal they can imagine up, then decorate a match box home for their pet rock to live in. This project is so fun and so creative. Want even more fun activities to do while its pouring down outside?? Don’t miss these great ideas!